Cosmos fans are taking over New York, as the newest watch party reached Queens. The 5 Points supporters have been bringing fans together to the Greene Turtle Sports Bar in East Meadow, New York since the Cosmos returned to the NASL in 2013. Supporters come together for road matches and watch their beloved team as a group. 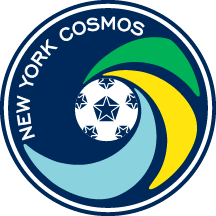 The Cosmos fans have been fortunate to enjoy three championships since the re-birth of the club, witnessing great milestones in recent years. Loving the team, its history, and supporting soccer have been at the core of the 5 Points since the beginning. The watch parties have been a place for fans to join together and chant out loud as one. It has also become a great way for new fans to learn about the 5 Points and the Cosmos as well as an opportunity for others to be part of the fun and share their passion for soccer. Barriles Sports Bar, located in Jackson Heights, New York is the latest spot for the 5 Points to watch their team on the road. This Colombian bar and restaurant is a popular destination for soccer lovers in the area, and now a great place to be for Cosmos fans. In honor of the inaugural viewing party at Barriles, the 5 Points presented the owner with a David Diosa jersey, being that the defender is a native of Medellin, Colombia. While the watch parties have become a great destination for the fans when the team plays away, nothing compares to home games for the 5 Points supporters. “As much fun as the viewing parties are, there is nothing like a live soccer match, especially with the 5 Points. The energy that the fans provide throughout MCU Park is amazing and we love to encourage the team,” said 5 Points supporter, Don Becker. The 5 Points are open to all Cosmos fans and are always looking for more fans to join the party. The supporters will watch Saturday's game at the Greene Turtle and Barriles Sports Bar and welcomes all Cosmos fans to make their voices heard.